Troubled by the dearth of minority lawyers in an impoverished state with a sizeable black population, bold-thinking visionaries recognized the need for a law school that would produce lawyers committed to pubic service and social justice. 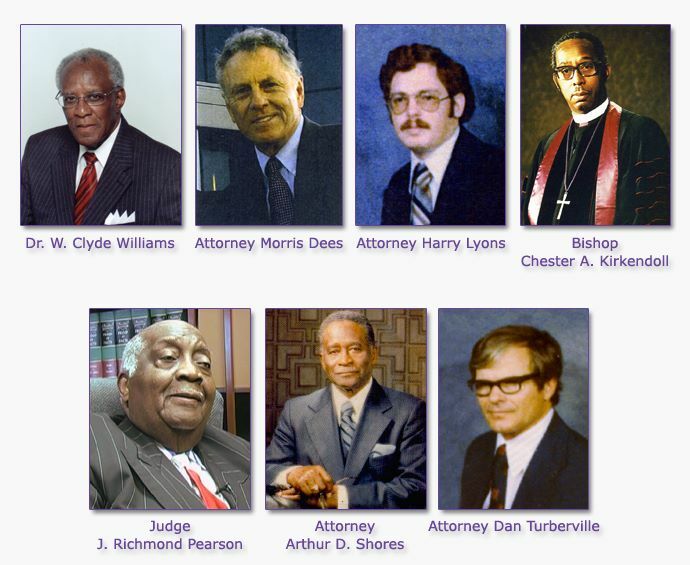 In the early 1970s, then Miles College President W. Clyde Williams, along with then Bishop of the Fifth Episcopal District of the Christian Methodist Episcopal Church, Chester A. Kirkendoll, now deceased, who served as chairman of the Miles College Trustee Board, Judge J. Richmond Pearson, then an Alabama state senator, and the school’s current chairman of the trustee board, Dan Turberville, Harry Lyons, Morris Dees, Esquire, co-founder of the Southern Law Poverty Center, Arthur D. Shores, noted civil rights attorney, now deceased, and others mobilized and provided the impetus for the school’s founding. It was out of this reality, concern and desire to change the legal landscape of Alabama that Miles Law School was founded, admitting its first class in August 1974. Before his appointment by President Jimmy Carter in 1980 as the state’s first black federal judge, then-State Senator U.W. Clemon served in an advisory role to the law school. Senator Clemon co-chaired with fellow State Senator J. Richmond Pearson an effort to raise funds for the fledgling school. Judge Clemon currently serves on the law school’s trustee board. The law school’s motto of “Striving to Balance” directly relates to the imbalance, disparity and disproportionality of black lawyers and of the underserved minority populace that existed in this state. Since the first graduates in 1978, the law school’s sons and daughters have made tremendous strides in closing the gap. Current board chairman Judge Pearson recounts the challenges faced by the law school during its nascent beginnings.